1.0 out of 5 starsA sub-standard product. One of the selling points for this futon mattress was that in the description it noted - 9" of cotton compacted to 6". That sounded firm to me. I took the reviews into consideration. Some were good, some were bad. In good faith, I went with it anyway. Let me share my experience. Right out of the box I could tell this was not a mattress. It was a large pillow, and a limp one at that. I'm not very strong and I could pick up this mattress by myself. But, I followed the directions and let it rest on the floor for five days (to regain its shape.). Everyday I pushed on it and everyday my hand touched the floor. There is virtually no stuffing inside this mattress. I've seen more support in a dog bed. In a burst of optimism, my husband and I put the mattress on top of our futon frame. Not surprisingly, when we sat on it we found ourselves sitting on the futon slats. I don't know how the company that makes these stays in business. The mattress is on its way to Goodwill. 5.0 out of 5 starsSleeping like a baby! I got this for my son as it was like one he saw at Big Lots only they only had the full size version. He needed a queen size for his new frame as a full size futon is too small. I got a different mattress and kinda wish I had gotten this one. I got the same frame. He loves it. He is mentally disabled and I put it on my card and he will be paying me back. He has been sleeping a lot more soundly and is in a better mood. He is 6 foot 3 inches and so the old futon was a bit small. The mattress was shot and he did not sleep good. Now, he is a happy camper. He has back issues and it is much better now that he has a good firm mattress to sleep on. Update: I just bought me one as I had purchased a different mattress for my futon. My back thanks me. I am sleeping much better. It works on my frame better too. I have the tri-fold wooden one. 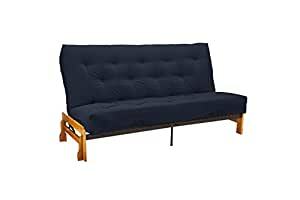 I bought this for a futon frame that I purchased because it was the size futon that fit my old frame. This was way to small for the frame that I bought so I put this on top of my mattress and I have been sleeping really well since. I am and was dissatisfied with product. Minus taking the 26 shipping charge to return it. The box completely broke so unable to ship back. Don't purchase this. There is way better out there. Even Wal-Mart puts this one to shame.